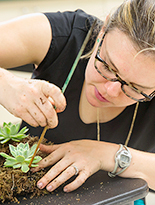 From gardening practices to nature study and everything in between—the Missouri Botanical Garden offers a full range of classes for adults, families and children of all ages. The Garden offers weekend, evening and weekday classes and programs year-round! Classes are available at our three campuses throughout the St. Louis area: the Missouri Botanical Garden, the Shaw Nature Reserve and the Sophia M. Sachs Butterfly House. View a complete list of classes and register online today! For questions, call (314) 577-5140 or e-mail classes@mobot.org. Give the gift of knowledge! Instead of the typical “stuff,” give that hard-to-buy-for friend or family member a fun, memorable experience. Missouri Botanical Garden and its family of attractions offer many engaging and enriching classes throughout the year. Purchase a gift card that can be used for classes, as well as for admission, merchandise, membership and more.